William Matthew Prior was an artist and a practical man. He certainly had the ability to paint portraits in an academic manner yet he offered his services for the type of portrait his sitters were willing to pay. His “flat” portraits, “Portraits/Painted in this style! /Done in about an hour’s sitting/Price $2.92, including Frame, Glass, &c.”. His more sophisticated style of portraits were sold for between $10 and $25, depending on details and props used for the portrait. 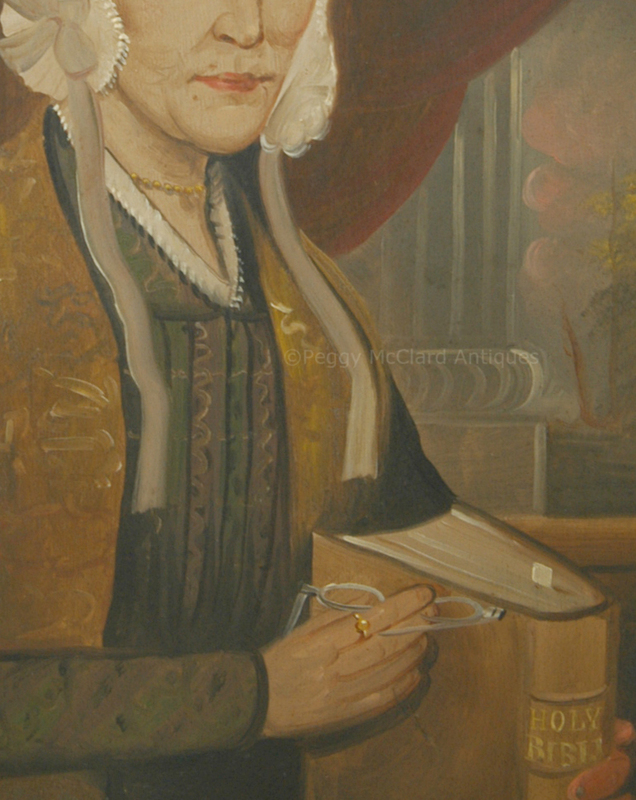 Offered is one of Prior’s more realistic portraits (actually, his "middle" work), painted for a lady of some wealth who could afford detail included in her portrait. We see the same characteristics found in most all of Prior’s work, such as white paint used to highlight around the nose, mouth and eyes of his sitters, bulbous-tipped noses drawn with a continuous line from the eyebrow to one side of the nose, and hands, fingers and nails outlined by brown paint. 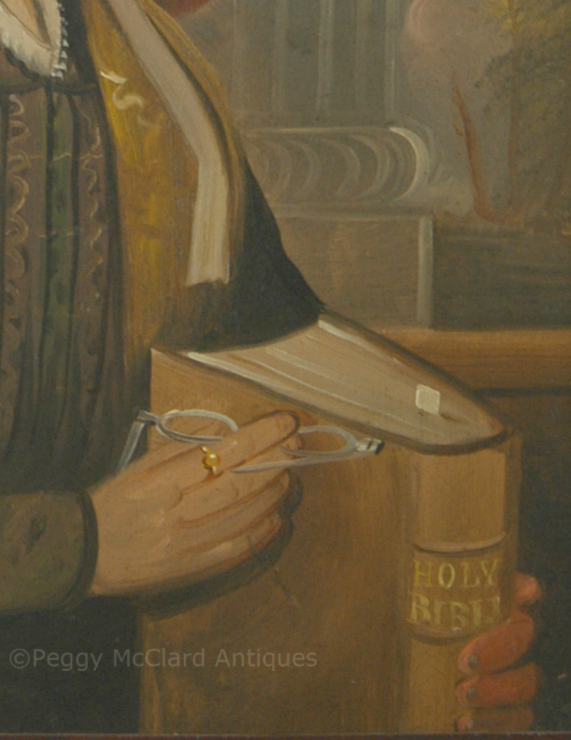 The woman sitting in this portrait wanted Prior to depict her as educated and religious, hence the Holy Bible which she holds, her reading marked by a Bible marker, her spectacles in hand. She gazes at the viewer with serene blue eyes. Prior did not try to hide the sitter’s years of experience as we are allowed to see her wrinkles and even a couple of blemishes. She has the look of a warm, loving individual. Prior’s composition works to pull the full and complicated painting into a cohesive and pleasant experience. 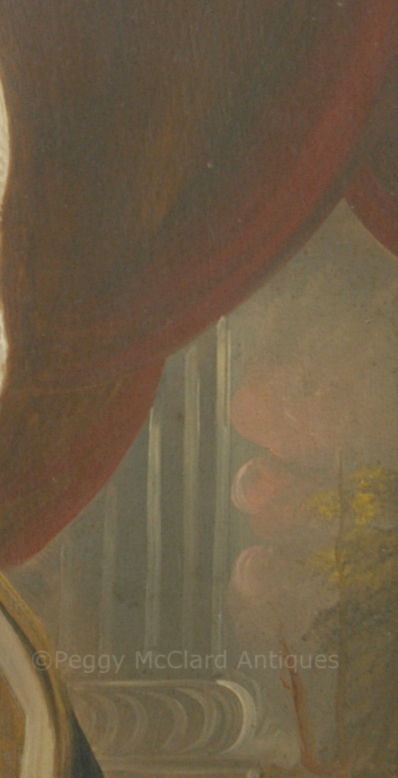 The billowy edge of the red drape echoes the billowy pink clouds seen through the window as well as the front edges of the sitter’s bonnet. The soft V of her neckline echoes the shape of her chin but is softened by her gold beaded necklace. 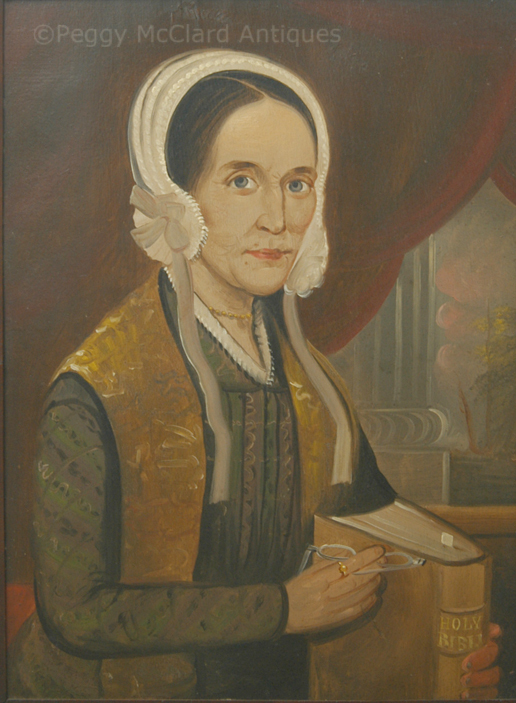 The straight vertical pleats of her dress front echo the fluting of the column outside the window and even the downward direction of her arm, the vertical stance of the Bible and the edges of her shawl. The color theme is played over and over…the red of the drapery, the red upholstered chair or sofa on which she sits and the red tinge of the sky outside. 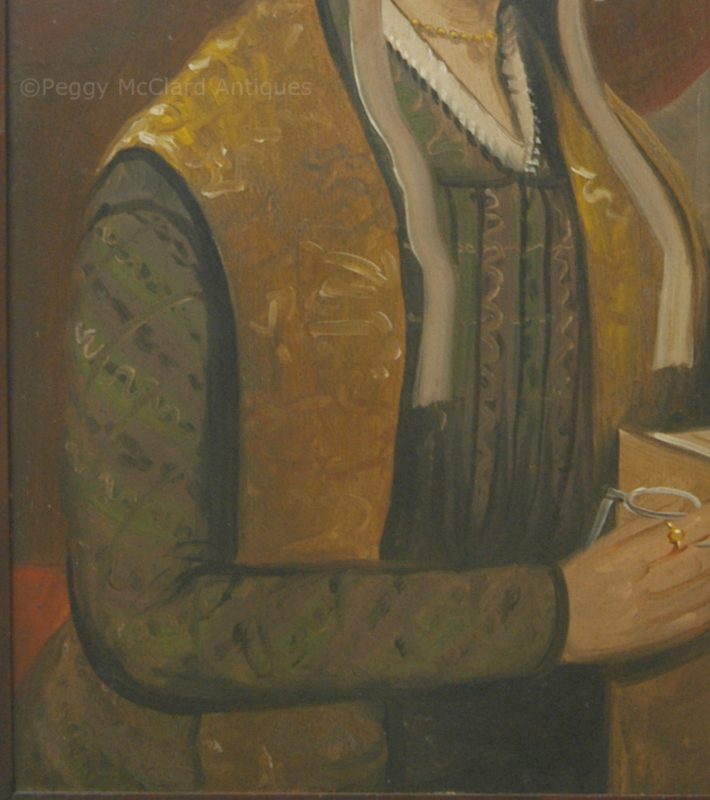 The gold of her shawl, her Bible, her necklace and ring and the pattern in her green dress. The green of her dress is echoed by green outside the window. The patterns of her clothing are interesting in that the vary slightly from sleeve to pleat to shawl, but all provide a subtle textural element to the overall composition. Her bonnet and collar seem to be edged with a very similar lace. 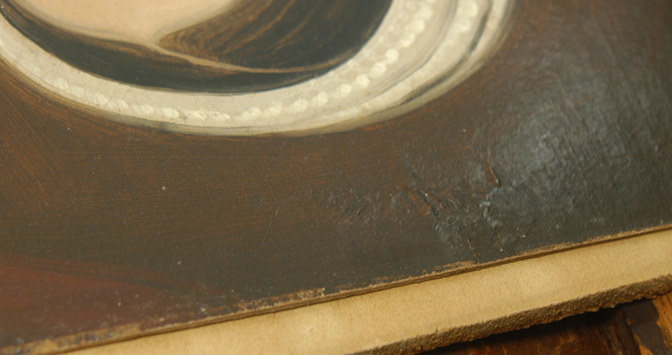 The lady is oil on the homemade paperboard that Prior so often used, especially for his small, flat portraits. 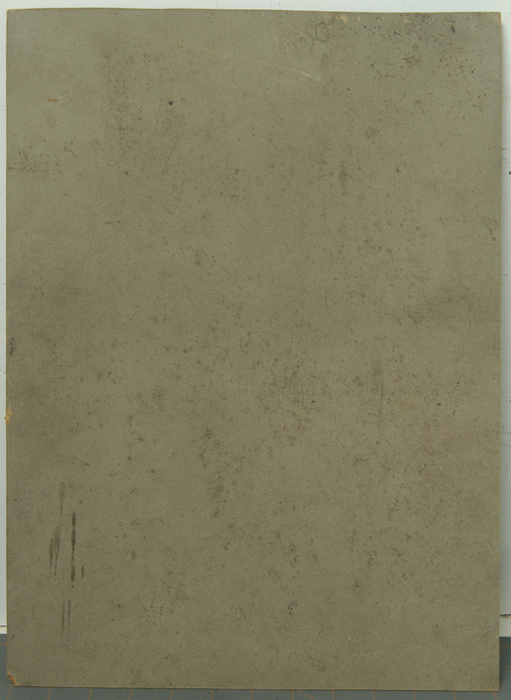 The board is in the best shape that I’ve ever seen for what appears to be an untouched piece. The board measures 16 ¼” x 12 ¼” and has the slightest warp in the center….but has apparently been tucked tightly into this frame for its entire life so has no warp at top, bottom, or sides. I can’t find a bit of inpainting under blacklight but there is a small splotch of thicker paint above the lady’s head which I believe was a mistake that Prior, himself, remedied. It resides in what must be the original paint decorated frame. I say that it is likely original because it is of a type that Prior used and painted himself, it is of original size, and the wear on the portrait from a frame fits this frame perfectly. Framed size 16 1/4" x 12 1/4". While this painting is not signed, the attribution to William M. Prior, himself, is bolstered by Michael & Suzanne Rudnick Payne and a copy of their correspondence regarding the attribution will be provided to the buyer. 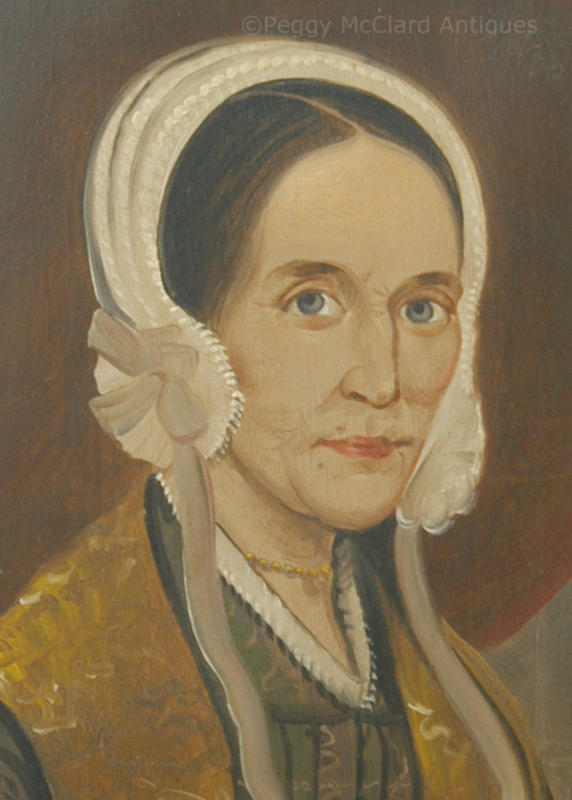 Circa 1840. A real gem to center your American folk art collection. 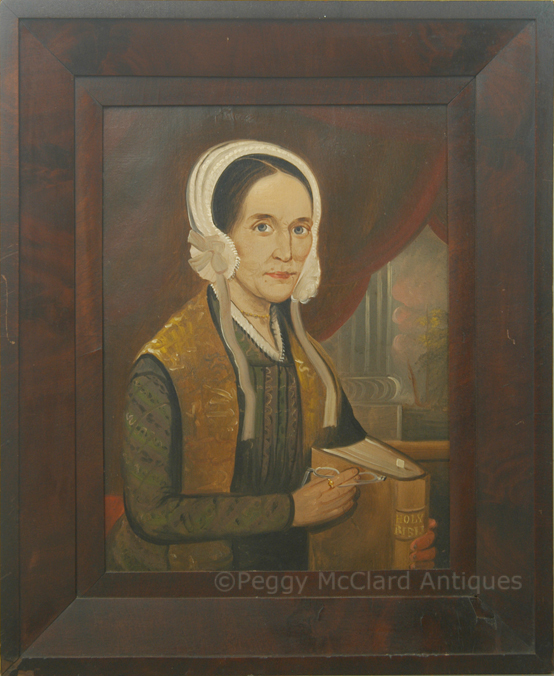 Please see the Folk Portrait Artists page for more information about William Matthew Prior . Hickman, Madelia & Pratt, Wayne, "The 'Celebrated' William Matthew Prior (1806-1873)", Antiques & Fine Art Magazine, online article at www.antiquesandfineart.com. Krashes, David, "Understanding the Prior-Hamblen School of Artists A Little Bit Better", Maine Antique Digest, July, 2011, attached pdf graciously presented courtesy of Maine Antique Digest. Rumford, Beatrix T. American Folk Portraits Paintings and Drawings form the Abby Aldrich Rockefeller Folk Art Center. New York Graphic Society, 1981. 176-81. Sears, Clara Endicott, Some American Primitives: A Study of New England Faces and Folk Portraits, Kennikat Press, Inc., Port Washington, N.Y., 1941. 31-50.